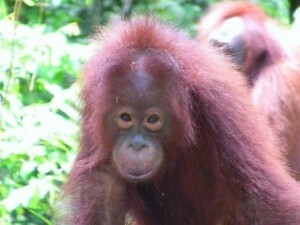 Borneo orangutan is a very strong animal with long arms, the adult male weight up to 1 kilogram. They can live up to 45 years old and start breeding between 12 and 15 years old, with nine months gestation period as a woman. As a great ape, orangutan is the humankind’s closest living relative in the animal kingdom, it can be seen when they are approaching and asking man to feed them. Orangutans are perfectly adapted to live in the forest, they are rarely descending to the forest floor, they build their nomadic nest on different tree every night, with material of twigs and tree branches, their diets including; fruit, young plants, and insects. The Banjarmasin town is River Oriented where houses on stilts lined the waterways crisscross the capital. Cruise the canal by motorized boat, especially in the morning or afternoon hours, shows the town from the inside, like people bathing, doing laundry, buying fruit, vegetable and fish in a tiny canoes of women vendors. The floating market is one of main tourism objects in this town. The market is available from 05:30 – 08:30 in the morning. At the location we can enjoy tradition of Banjarese people trading vegetables, fruit, drinks, cakes, and many kinds of other daily needs. Buyers can buy these commodities on board of their boats or from small stall attached to the back of people houses.